Simple but cheerful! And who doesn’t need a birthday card from time to time? 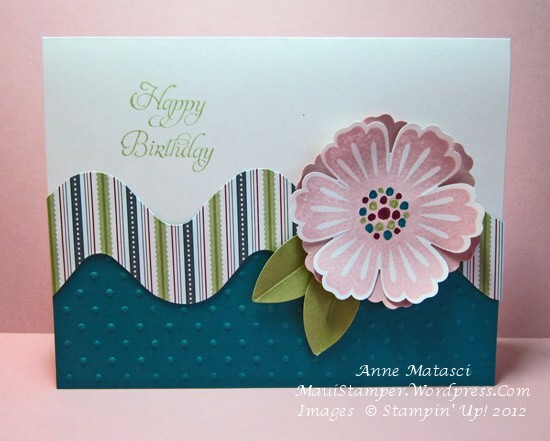 The Mixed Bunch image is stamped on Whisper White and punched for the top layer, but the second layer is just punched from Blush Blossom – no one can see any stamping there anyway! I used my Simply Scored tool to put those lines on the leaves, but you could manage quite easily with a bone folder and a straight edge. I intentionally didn’t put a button in the middle of that flower, although it was begging for one, as I wanted to be able to mail this card without extra postage. Now, a word about adhesives; don’t make it hard for yourself! Buy quality adhesives and have a couple of different things on hand, and you’ll find your card-making goes so much more smoothly. Glue dots are great for adhering layers like the two punched flowers, but they are indispensible for tucking those skinny little leaves UNDERNEATH the blossom. A Stampin’ Dimensional gives you – well – DIMENSION, and it also provides a little room to squeeze in those leaves. Get the adhesive. Be kind to yourself. You deserve it. Announcing…Anne and Crystal’s Spring Extravaganza!